A pre-race sample was taken from Johnny Utah. Our Harley Quinn and Limburg Sprite were quick to begin. Shadow Bo was slow to begin. Fish Armo and Johnny Utah collided soon after the start. Limburg Sprite, Bat The Brat and Fish Armo collided on the first turn, checking Bat The Brat. Fish Armo checked off Limburg Sprite approaching the home turn. Our Harley Quinn and Da End collided approaching the home turn. 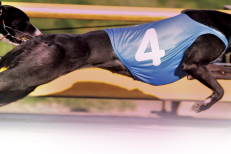 Bat The Brat checked off the heels of Limburg Sprite on the home turn and collided with Fish Armo, resulting in both greyhounds racing wide. Kissable and Johnny Utah collided in the home straight.